Born in Pskov, Russia, Oxana Fedorova lived there until she was 18. An only child, she was brought up by her mother and maternal grandparents. Fedorova’s parents divorced when she was three years old. She did not hear from her father since then. In 2005 Oxana tried to find her father, but discovered he had died. Her father was a nuclear physicist, and her mother worked as a nurse at a psychiatric hospital. Seven years of her personal life, including the period of the Miss Universe 2002 pageant, were associated with St. Petersburg businessman Vladimir Golubev (22 years older than her). In an interview, Oksana recognized that this person has played “a huge role” in her life and that Golubev (known in the criminal world as Barmalej) is close to the image of “the perfect man in the world”. In 2004, Oksana pondered Golubev proposal of marriage, but by 2006, stated that “the period of our romantic relationship ended”. After parting with Golubev, for a short time, Fedorova was having an affair with her partner on the show “Dancing with the Stars’ Alexander Litvinenko. Since 2007, Oksana was married to a German businessman Philip Toft. In 2009, still not having issued an official divorce, Oksana announced her engagement to Nikolai Baskov. April 19, 2010 it was announced that Fedorova divorced her husband Philip Toft. March 3, 2011 – Fedorova and Baskov at a concert in the Kremlin confessed in their break up. September 16, 2011 Oksana announced that six months ago she married an FSB officer, now a staff member of the Presidential Administration of the Russian Federation Andrei Borodin. Fedorova said many times that found her female happiness in her marriage with Borodin, with him she feels like behind a stone wall. March 6, 2012 Oksana gave birth to a son, Fyodor. Oksana said to the press about wanting to raise a son in the Orthodox tradition, and she wants him to become a military man. December 6, 2012 Oksana said that she took her husband’s name, and now she’s on the passport – Borodina. 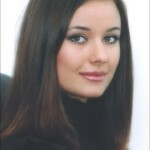 Oxana Fedorova established the children’s charitable foundation Спешите делать добро! “Hurry To Create Wonders!” in October 2009. The Ministry of Defense of Russia and the Russian Club of Orthodox Maecenases assisted in organizing the project. The foundation provides support to orphans and children who find themselves in difficult situations. 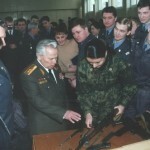 Special attention is given to children whose parents were killed while serving the Ministry of Internal Affairs or the Russian Armed Forces. She has been involved in the children’s charity program, “МИР БЕЗ СЛЕЗ” (World Without Tears) since 2004. 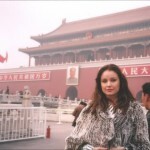 Oxana Fedorova is on the Russia Board of Advisors for the Russian Children’s Welfare Society (RCWS). Fedorova has been representing UNICEF in Russia since May 2006. She became a UNICEF Goodwill Ambassador for the Russian Federation on September 17, 2007. In her capacity as a UNICEF Goodwill Ambassador, Oxana Fedorova has participated in various missions, including the joint UNICEF-Pampers “1 Pack = 1 Vaccine” tetanus campaign to the Democratic Republic of the Congo in September 2008, and to the country of Laos in December 2010. She has also taken part in the UNICEF Peace and Tolerance program in Dagestan, Russian Federation in July 2008 and 2009.